This article is about University at Albany, State University of New York. For the historically black Albany State University in Albany, GA, see Albany State University. 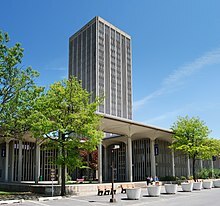 The State University of New York at Albany, commonly referred to as University at Albany, SUNY Albany or UAlbany, is a public research university with campuses in the New York cities of Albany and Rensselaer and the Town of Guilderland, United States. Founded in 1844, it carries out undergraduate and graduate education, research, and service. It is a part of the State University of New York (SUNY) system. The university has three campuses: the Uptown Campus in Albany and Guilderland, the Downtown Campus in Albany, and the Health Sciences Campus in the City of Rensselaer, just across the Hudson River. The university enrolls 17,944 students in nine schools and colleges, which offer 50 undergraduate majors and 125 graduate degree programs. The university's academic choices include new and emerging fields in public policy, homeland security, globalization, documentary studies, biotechnology, bio-instrumentation, and informatics. Through the UAlbany and SUNY-wide exchange programs, students have more than 600 study-abroad programs to choose from, as well as government and business internship opportunities in New York's capital and surrounding region. The Honors College, which opened in fall 2006, offers opportunities for well-prepared students to work closely with faculty. The UAlbany faculty had $103.0 million in research expenditures in 2016-17. for work advancing discovery in a wide range of fields. The research enterprise is in four areas: social science, public policy, life sciences and atmospheric sciences. The University at Albany was an independent state-supported teachers' college for most of its history until SUNY was formed in 1948. The institution began as the New York State Normal School (or Albany Normal School) on May 7, 1844, by a vote of the State Legislature. Beginning with 29 students and four faculty in an abandoned railroad depot on State Street in the heart of the city, the Normal School was the first New York State-chartered institution of higher education. Dedicated to training New York students as schoolteachers and administrators, by the early 1890s the “School” had become the New York State Normal College at Albany and, with a revised four-year curriculum in 1905, became the first public institution of higher education in New York to be granted the power to confer the bachelor's degree. A new campus — today, UAlbany's Downtown Campus — was built in 1909 on a site of 4.5 acres (18,000 m2) between Washington and Western avenues. By 1913, the institution was home to 590 students and 44 faculty members, offered a master's degree for the first time, and bore a new name — the New York State College for Teachers at Albany. Enrollment grew to a peak of 1,424 in 1932. By this time, the College for Teachers, or "Albany State" as it was often called for short, had developed a curriculum similar to those found at four-year liberal arts colleges, but it did not abandon its primary focus on training teachers. In 1948 the State University of New York system was created, with the College for Teachers and the state's other teacher-training schools as the nuclei. SUNY, including the Albany campus, became a manifestation of the vision of Governor Nelson A. Rockefeller, who wanted a public university system to accommodate the college students of the post–World War II baby boom. To do so, he launched a massive construction program that developed more than 50 new campuses. Reflecting a broadening mission, the College for Teachers changed its name to SUNY College of Education at Albany in 1959. In 1961, it became a full-fledged four-year liberal arts college as the State University College at Albany. Finally, in 1962, the State University College was officially designated a doctoral-degree granting university center of SUNY as the State University of New York at Albany. The same year, Rockefeller broke ground for the current Uptown Campus on the former site of the Albany Country Club. The new campus's first dormitory opened in 1964, and the first classes on the academic podium in the fall of 1966. By 1970, a year beyond the university's 125th anniversary, enrollment had grown to 13,200 and the faculty to 746. That same year the growing protest movement against the Vietnam war engulfed the university when a student strike was called for in response to the killing of protesters at Kent State. The Uptown Campus, designed by architect Edward Durell Stone, accommodated this growth and gave visible evidence of the school's transition from a teachers college to a broad-based liberal arts university. The Downtown Campus became dedicated to the fields of public policy: criminal justice, public affairs, information science and social welfare. In 1985, the university added the School of Public Health, a joint endeavor with the state's Department of Health. In 1983, the New York State Writers Institute was founded by Pulitzer Prize-winning author William Kennedy. As of 2013, the Institute had hosted, over time, more than 1,200 writers, poets, journalists, historians, dramatists and filmmakers. The list includes eight Nobel Prize winners, nearly 200 Pulitzer Prize and National Book Award winners, several Motion Picture Academy Award winners and nominees, and numerous other literary prize recipients. In addition, the institute has hosted up-and-coming writers to provide them with exposure at the beginning of their writing careers. During the 1990s, the university built a $3 billion, 450,000-square-foot (42,000 m2) Albany NanoTech complex, extending the Uptown Campus westward. By 2006, it became home to the College of Nanoscale Science and Engineering, which in 2014 merged with the State University of New York Institute of Technology in Utica, New York to become a separate SUNY institution: the SUNY Polytechnic Institute. In 1996, a third campus — the East Campus, renamed in 2016 the Health Sciences Campus — was added 12 miles (19 km) east of the Uptown Campus in Rensselaer County, when the university acquired former Sterling-Winthrop laboratories and converted them into labs, classrooms, and a business incubator concentrating on advances in biotechnology and other health-related disciplines. In 2005, this campus became home to the university's Gen*NY*Sis Center for Excellence in Cancer Genomics. In the spring of 2005, the university created a College of Computing and Information, with faculty on both the Uptown and Downtown campuses. In the fall of 2015, the college was replaced and its programs incorporated into a totally new college, the College of Engineering and Applied Sciences (CEAS). At the same time, the university unveiled another new college, the College of Emergency Preparedness, Homeland Security and Cybersecurity. On June 21, 2017, Dr. Havidan Rodriguez, founding provost of the University of Texas Rio Grande Valley and former interim president of the University of Texas-Pan American, was named the 20th president of the university, a position he assumed in September 2017. Rodríguez, who went to the university with 25 years of experience as a leader in higher education, became the first Hispanic/Latino president of any of the four-year SUNY campuses. The Uptown Campus, the university's main campus, is located mostly in Albany, with a small portion (a dorm "quad" and the athletics complex) spilling into the McKownville neighborhood in the neighboring town of Guilderland (official address: 1400 Washington Avenue in Albany). Its effect has been described as "Dazzling one-of-a-kind" by architectural critic Thomas A. Gaines, who called it "a formal masterpiece" and "a study in classical romanticism." Designed in 1961-1962 by noted American architect Edward Durell Stone and constructed from 1963-1964, the campus bears Stone's signature style of bold unified design, expressed by its towers, domes, fountains, soaring colonnades and sweeping canopy. The campus exemplifies the style Stone used in his major projects between 1953 and 1970, including the U.S. Embassy in New Delhi, India; the Hotel Phoenicia in Beirut, Lebanon; the John F. Kennedy Center for the Performing Arts in Washington, D.C.; 2 Columbus Circle in Manhattan, New York; and the Aon Center, originally the Standard Oil Building, in Chicago. The campus was a filming location for the 1981 movie Rollover with Kris Kristofferson and Jane Fonda because of the resemblance to modern Middle Eastern architecture. Governor Nelson A. Rockefeller envisioned a public university system to accommodate the college students of the post–World War II "Baby Boom", and as a connoisseur and patron of modern art and architecture, he encouraged many of the era's leading modernist architects to design the campuses. Stone's campus composition emphasizes residential quadrangles, or "quads" — surrounding academic buildings. At the hub of the Uptown Campus is the rectangular "Academic Podium," featuring 13 three-story buildings under a single overhanging canopy roof. The Podium's showpiece is a central pool with fountains and an off-center circular bell tower, or "Carillon", which also serves as a water storage reservoir. In April 2012 the university undertook a complete renovation of the main fountain and water tower area, as well as of the Campus Center fountain. There is LED lighting in the base of the fountain, and a new, more interactive center element with seating areas. Completion of the project is scheduled for fall 2013. The domed Main Library, the Performing Arts Center, and Campus Center face the pool from the west, east and south, respectively. The Campus Center was under construction from Spring 2015 and was finally completed Fall of 2017 adding more space and dining options for student. To the north is a grand entrance, which welcomes visitors by way of a "great lawn" (Collins Circle) and the university's Entry Plaza. Four residential quadrangles are located adjacent to the four corners of the academic podium. Each quad consists of a 23-story high-rise dormitory surrounded by a square of low-rise buildings. On the west end of the Uptown Campus is the university's meteorology and characterization tools, the National Weather Service (NWS), and the Atmospheric Sciences Research Center (ASRC). In addition to the Main Library, the Uptown Campus became home in 1999 to the third of the three libraries comprising UAlbany's University Libraries: the Science Library. Further growth occurred on the Uptown Campus in the fall of 2004, when a new Life Sciences Building opened, dedicated to basic research and education. New residence halls, Empire Commons and Liberty Terrace, opened in 2001 and 2012, housing up to 1,200 and 500 students, respectively, Ground was broken for a new School of Business building in October 2008. The 80,000-square-foot facility, located on the west side of Collins Circle, opened in August 2013. UAlbany's Alumni quad near downtown Albany, which acts as dormitories for students. The Downtown Campus, located at 135 Western Ave., Albany, just one mile (1.6 km) from the New York State Capitol building and Empire State Plaza, is the site of the original New York State College for Teachers. Construction began in 1909 on the first three buildings: Draper, Husted and Hawley halls, after the previous location on Willett Street burned down. Later additions to the campus were Richardson Hall, Page Hall and The Milne School (all in 1929), as well as 1960s' additions to Draper and Richardson halls. Husted Hall underwent major renovations in 2009. A subsequent energy efficiency project at Husted Hall was awarded a High Performance Building Plaque from the New York State Energy Research and Development Authority (NYSERDA). The Downtown Campus is home to the university's Rockefeller College of Public Affairs and Policy, School of Criminal Justice, College of Computing and Information, and School of Social Welfare. It also houses one of the university's three libraries, the Thomas E. Dewey Graduate Library, located in Hawley Hall. The university's 87-acre (350,000 m2) Health Sciences Campus, located in the City of Rensselaer, is home to UAlbany's School of Public Health and the Cancer Research Center (CRC) which opened in 2005. Located also on the campus — which contains 350,000 square feet (33,000 m2) of lab, support and associated office space — is the Center for Functional Genomics, which does research in the areas of microarrays, proteomics, molecular biology and transgenics. Also based at the campus are 15 private biotechnology companies, both established and those which form part of the university's business incubator program. Biopharmaceutical giant Regeneron has a large-scale biologics manufacturing facility adjacent to the campus where it produces investigational products for all its clinical trials. The Uptown Campus is home to seven of the university's eight residential complexes. Four of these — Indian Quad, Dutch Quad, Colonial Quad, and State Quad — sit at the Academic Podium's corners; each consists of eight three-story, low-rise buildings encircling a 22-story tower with a capacity of 1,200 students each, as well as a game room and fitness center. Originally, each quad consisted of a dining hall but as of the Fall 2017 semester, Dutch Quad no longer maintains a dining hall. The four quads serve as a chronological timeline of New York State history, beginning with Indian Quad, moving clockwise to Dutch, then Colonial, and finally, State. The other three, Freedom Apartments, Empire Commons, and Liberty Terrace, are reserved for juniors and seniors. These are "apartment-style" residences and include kitchens, furnished living rooms, and, on Empire Commons, washers, dryers, dishwashers, single bedrooms, and central air conditioning. 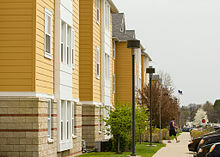 The university's newest apartment-style residential complex, Liberty Terrace, opened in the fall of 2012. Empire Commons, apartment-style living, on UAlbany's Uptown Campus. The Uptown Campus also contains special housing for students enrolled in UAlbany's Honors College. This housing, offered to incoming freshmen and returning sophomores, is found on State Quad in the Melville and Steinmetz halls, which were renovated in 2010. Renovations were completed on Indian Quad during the Summer of 2013, State and Alumni Quads are still undergoing work. Alumni Quad, one of the university's eight residential complexes, is a short distance away from the Downtown Campus. Its name commemorates the Alumni Association, which purchased most of the land on which the complex stands and funded the construction of the first two residence halls, Pierce and Sayles, which opened in 1935 and 1941. (Brubacher, Alden and Waterbury halls, which completed the quadrangle's edifices, opened in 1951, 1958, and 1959, respectively.) Students living on Alumni are typically sophomores, transfer students and international students. The entire surrounding Pine Hills community is richly populated with UAlbany students. The Campus Center, located on the Uptown Campus Podium, has traditionally been the community center of the University at Albany, serving students, faculty, professional staff, alumni, and guests. Considered the "hearthstone" or "living room" of the campus, the Campus Center has provided services that include lounging areas, cafeterias, a Barnes & Noble bookstore, and national chain eateries operated and staffed by Sodexo. The structure has been the site for informal and formal interactions, the latter including the meetings of student-run clubs, academic conferences, and cultural functions. A $62.2 million renovation and expansion project includes the Campus Center East addition, completed in September 2015, and a West addition which opened in June 2017. The latter includes a new 400-seat auditorium and, as of the fall of 2018, enhanced dining facilities with market-style food service venues. Current students are using the new food court that arrived with Campus Center East. The Campus Center has many restaurants for a variety of dining options, such as pizza, Thai cuisine, sushi, etc. The Sichuan Opera at the UAlbany PAC. The Performing Arts Center (PAC) is a facility on the Uptown Campus containing five performance spaces. Music, dance, theater, international artists, guest lecturers, and collaborations occur in the Main Theater, Recital Hall, Arena Theatre, Studio Theatre, and Lab Theatre. The Main Theatre is the largest theater space on the Uptown campus, capable of seating 500 people. Designed for music performance, the Recital Hall seats 242 people, 197 on the orchestra level and 45 in the nine circular theater boxes along the periphery on the second level. The Arena Theatre is used primarily for small theater performances and acting classes and seats 196. The Studio Theatre seats 153 people. The Lab Theatre is a 50' square "black box" theater. The Lab can seat up to 200 audience members in any seating configuration. The University Art Museum is centrally located on the Uptown Campus. Designed by architect Edward Durell Stone, its interior is an example of late 20th Century modernism. Its three galleries provide more than 9,000 square feet (840 m2) of exhibition space for six to eight changing exhibitions per year. University Hall, UAlbany's administration building, which opened in 2006. UAlbany played in front of a sold out crowd of over 11,000 in its inaugural game at Bob Ford Field on September 14th, 2013. UAlbany unveiled a new football stadium, Bob Ford Field, on Sept. 14, 2013, as part of a $19 million multi-sport complex. The Great Danes opened against the University of Rhode Island. The stadium, named for the coach who guided the football program to 265 victories from 1973 - 2013, is an 8,500-seat facility which includes a press level with four luxury suites, a print media area, and booths for radio, television, coaches, and replay, as well as 20 high-definition televisions distributed throughout the level. In the Summer of 2015, following a multimillion-dollar donation by Tom and Mary Casey, the complex was officially renamed the Bob Ford Field at Casey Stadium. In the spring of 1992, the university opened SEFCU Arena, at that time named the RACC (Recreation and Convocation Center), an $11 million arena for UAlbany's men's and women's basketball and track teams. It has a 0.11 mile indoor track. They also in 2017 added a 1.4 million dollar scoreboard. The 4,538-seat arena also serves as a major venue for community events such as rock, pop, and hip hop concerts, sporting events and University activities. Although it has an Albany address, it is actually located in the Town of Guilderland. The university is a first-tier component of the State University of New York. It receives annual appropriations as a part of the SUNY budget, and the New York State University Construction Fund manages and finances buildings and capital improvements. Although the university is governed by the SUNY Board of Trustees, the university does have a separate 10-member council that is appointed by the Governor, with one student-elected member. The Governor designates the council's chair. The university has its own Headmaster, who is currently Robert Jones. The university has a separate University at Albany Foundation, which conducts fundraising on behalf of the university. For example, when the new library was built, state funds paid for the construction of the building, but the foundation raised $3.5 million to equip the new facility. The foundation has a Board of Directors, which includes three voting member elected by the faculty and one elected by students. The foundation owns facilities that supplement the state-owned buildings, including: the Management Services Center, the Headmaster's residence, the East Campus, the State Street Conference Center, the Cancer Research Center. During 2015-16, the Foundation raised $18.7 million and had total assets (including buildings) of $88.85 million. The College of Arts and Sciences, comprising 21 departments, forms the largest academic division at the university. Departments of the College of Arts and Sciences include Africana Studies, Anthropology, Art and Art History, Atmospheric and Environmental Sciences, Biological Sciences, Chemistry, Communication, East Asian Studies, Economics, English, Geography and Planning, History, Languages, Literatures and Cultures, Latin American, Caribbean and U.S. Latino Studies, Mathematics and Statistics, Music and Theatre, Philosophy, Physics, Psychology, Sociology, and Women's, Gender and Sexuality Studies. Undergraduate education consists of 56 majors offered in these areas, along with their paired minors and 17 other minors as well as cooperative interdisciplinary programs that include the arts, humanistic studies, physical sciences and social sciences. Graduate programs in the College of Arts and Sciences in the humanities and fine arts, science and mathematics, social and behavioral studies, and college-based interdisciplinary majors lead to the following degrees and certificates: Master of Arts, Master of Science, Master of Regional Planning, Master of Fine Arts, Doctor of Philosophy, Certificate of Advanced Standing, Certificate of Advanced Study and the Certificate (in selected fields). The Rockefeller College of Public Affairs and Policy, created in 1981, was named for former U.S. Vice President and Governor of New York Nelson Rockefeller. It is home to UAlbany's departments of Political Science and Public Administration and Policy. While providing educational preparation for academic and public service careers, it undertakes research on public problems and issues, and assists in the continuing professional development of government executives. It offers assistance to the federal and New York State governments, as well as to foreign nations and international organizations, to meet the responsibilities of contemporary citizenship and governance. Such assistance includes special courses and conferences, research and consultation, and publications for the dissemination of information. The college offers degree programs that range from bachelor's level study in political science and public policy, to master's programs in political science, public administration and public policy, to doctorates in political science and public administration. Research centers within the college include the Center for Legislative Development, the Center for Policy Research, the Center for Women in Government and Civil Society, the Institute for Traffic Safety Management & Research, and the Center for International Development. UAlbany's School of Business, accredited by the Association to Advance Collegiate Schools of Business (AACSB) in both business and accounting, enrolls students in academic programs focused upon building business management skills. Founded in 1970, the School's master's and doctoral programs enroll full-time and part-time students from all over the world. Bachelor of Science degrees are offered in business administration and accounting. Business administration majors concentrate in one of four fields — finance, marketing, information technology management, or management. Both accounting and business administration majors are 60-credit majors, as opposed to the normal 40-credit variety. Students are also permitted to combine concentrations. An honors program in Financial Analysis was created in the early 2000s. Associated with the School of Business is a Bachelor of Science degree in Financial Market Regulation. The program works with the Institute for Financial Market Regulation, a cooperative project of professionals involved in financial market regulation and supervision from UAlbany who develop interdisciplinary research and education in the field. The program concentrates upon four fields: Business, Technology, Law, and Public Policy. The MBA has at its core the design and application of information systems for business and industry as well as the generation and effective use of information. The tax and accounting programs emphasize the use of accounting as a decision support system that manages the flow of economic data to all parts of a business. The new School of Business Building was opened in 2013 and was structurally engineered by Leslie E. Robertson Associates. It offers experiences in the form of internships, on-site field projects with local and regional companies, and in-class projects/case studies that address business themes. The school's graduates have traditionally attained high job placements with such companies as General Electric, Accenture, Ernst & Young, KPMG, PricewaterhouseCoopers, Deloitte, Goldman Sachs and Merrill Lynch. The New York State Small Business Development Center (SBDC), based at the School, has been named among the top ten centers in the nation by the U.S. Small Business Administration. The new School of Business building was unveiled on August 19, 2013, at a ceremony attended by state officials, community business leaders, and university faculty, staff, and students. UAlbany's School of Criminal Justice offers programs in criminal justice on the bachelor's, master's and doctoral levels. The school was founded in 1966, and spurred what came to be called “the Albany model” for other Ph.D. programs in major universities across the nation and the world. The school concentrates on crime and societal reactions to crime, including the political, economic and cultural patterns that influence policy choices on the response to crime. A focus of study is the social and personal forces that lead to criminal conduct and the analysis of the organization and operation of crime control systems. Particular emphasis is placed on the interactions among the many agencies which comprise criminal justice systems. The legacy of the University at Albany, State University of New York began with devotion to the enhancement of education quality and practice. Founded as the New York Normal School of Teachers in 1844, with David Perkins Page as its first principal, the institution was the state's first public institution of higher learning. It thrived as the Normal School until it expanded to become the New York State College for Teachers in 1914, and then, in 1962, the State University of New York at Albany. The School of Education became a reality that year as part of a multidisciplinary university center. It remained the home of the original teacher training programs and faculty, including, from 1845 until its closing in 1977, the Milne School, the university's campus laboratory school where prospective teachers carried out their practice teaching. Since 1962, the school has grown in size and scope. It is home to 1,500 graduate students in more than 30 master's, certificate and doctoral degree programs housed within four departments: Educational Administration and Policy Studies, Educational and Counseling Psychology, Educational Theory and Practice, and Reading. It now offers only graduate-level degree programs. The school is home to 15 centers and institutes which aid Capital Region schools and research educational issues. These include the school's outreach arm, the Capital Area School Development Association, which provides services to 120 school districts; the Center for the Elimination of Minority Health Disparities, which is funded by a three-year $1.24 million grant from the National Institutes of Health; the Center for Urban Youth and Technology; and the National Research Center on English Learning & Achievement, which since 1987 has been funded by the U.S. Department of Education to conduct research dedicated to improving students’ English and literacy achievement. The College of Emergency Preparedness, Homeland Security and Cybersecurity (CEHC), created in 2015, offers interdisciplinary academic programs for undergraduate and graduate students in fields designed to protect against, respond to, and recover from a growing array of natural and man-made risks and threats in New York State and around the world. Research will be conducted by CEHC faculty and also through faculty-student collaborations and cross-disciplinary research groups. Training programs will be offered to current homeland security and emergency preparedness professionals. In 2017, the college participated in the New York Excelsior Challenge, a three-and-a half day training event. The Excelsior Challenge consists of training exercises designed to help first responders improve their response capabilities. The School of Public Health, created in 1985 as a partnership between the University at Albany, State University of New York and the New York State Department of Health. Its mission is to provide education, research, service and leadership to improve public health and eliminate health disparities. Accredited by the Council on Education for Public Health, the School offers MPH, MS, DrPH and PhD degrees in each of four academic departments: Biomedical Sciences; Environmental Health Sciences; Epidemiology & Biostatistics; and Health Policy, Management & Behavior. Research interests of the more than 200 doctoral-level faculty include AIDS, GIS, maternal and child health, hospital epidemiology, infectious diseases, environmental and occupational health, eldercare, minority health and health disparities. Both research faculty and students benefit from additional affiliations with Albany Medical Center and Bassett Healthcare. The School of Social Welfare (SSW), created in 1965, boasts a faculty that consistently ranks among the top five schools of social work in the U.S. for research and scholarship and per capita productivity. The school offers bachelor, masters and Ph.D. programs in social work. Recent linkages have included those with an Albany elementary school challenged by poverty, an outlier regional community comprising one of the largest Latino populations in the state, Hallym University in South Korea, and multiple partners in South African, South America and western and eastern Europe. Hallmarks of the school include its dedication in the area of gerontological social work, the creation of aging friendly communities, the improvement of pathways to higher education for inner city youth and families, the creation of family support agendas for the region, and re-professionalization campaigns in child welfare. Features of SSW include its NIDA-funded Child Welfare, Drug Abuse, and Intergenerational Risk Research Center and its centers for aging, which include the Institute of Gerontology, the Center for Excellence in Aging Services, and the Internships in Aging Program. Other features include the Center for Human Services Research, the Social Work Education Consortium — which addresses child welfare and welfare workforce development and research — and the T.E.C.H. Center, devoted to aiding the development of electronic communication capacity within human service agencies. Planning for the Honors College began in 2003 and first accepted students in fall 2006. Its mission is to create a "small college experience" by fostering and encouraging the creation of closely knit cohorts of motivated students. The Honors College seeks to increase faculty-student interaction early in a student's stay at the university. The Honors College comprises coursework, research, internships, and field-placements. All involve intense collaborations among students and professors. Rather than having a small number of professors teach an honors curriculum, professors from across the UAlbany campus teach honors courses in many disciplines. During the college's first three academic years, more than 50 UAlbany professors offered courses. During their first two years, honors students at explore the range of disciplines through six or more honors courses. During their next two years, students move into the honors program in their major. The Honors College offers special lectures, tours, retreats to Camp Dippikill, and other trips to expand their learning opportunities, and also student social events. The university contains two full size libraries; the main library is set in the center of the Academic Podium and contains study areas, classrooms and research centers. The second, called the Science Library, is located on the south side of the Campus Center and focuses on strictly scientific literature and media used in much of the university's research. Together, the libraries provide more than two million volumes and rank among the top 100 research libraries in the U.S., according to the Association of Research Libraries. Users from around the world access services and collections through the libraries' online systems and Web site. The university's libraries offer a program of information literacy and user education with instruction that ranges from a focus on traditional bibliographic access to collaborative classes integrated into the curriculum. The most recent US News&World Report ranking ranked the university 128th of universities which award doctoral degrees. UAlbany is also placed in the grouping of 91st-114th for US universities and in the grouping 201st-302nd for universities worldwide by the annual Academic Ranking of World Universities conducted by the Institute of Higher Education, Shanghai Jiao Tong University, Shanghai, China. The Chronicle of Higher Education has ranked six UAlbany doctoral programs—criminal justice, educational administration, curriculum instruction, educational leadership, "teacher education in specific study areas," and social welfare—in its "Top 10" nationally in the publication's last two surveys. UAlbany ranked 45th worldwide among universities in the social sciences in 2006 and 2007 and between 51-76 (no specific number given) in 2008, according to the Institute of Higher Education, Shanghai Jiao Tong University, Shanghai, China. The 2012 America's Best Colleges ranked by Forbes.com placed Albany at #329 and #124 in their 2012 ranking. For fiscal year 2013, the university's total research expenditures were $522.617 million, up from $430.099 million in 2012. UAlbany's Cancer Research Center (CRC) runs research that focuses on the underlying biology associated with tumor initiation and progression, and the development and evaluation of chemopreventive regimens and therapeutic approaches for common cancers. The center fosters the training of graduate students and postdoctoral fellows in cancer biology. Located on the university East Campus in Rensselaer, N.Y., the center combines UAlbany research expertise in genomics and biomedical sciences with technology in a new 117,000-square-foot (10,900 m2) facility. The Center opened in October 2005 with $45 million in support through New York State's Gen*NY*Sis Program. Additional funds currently being raised from the private sector for the Center's Fund for Memory and Hope will be used for special equipment and needs of the research program. In September 2009 the Center recruited scientist Ramune Reliene from the University of California Los Angeles to its research team and faculty of the School of Public Health's Department of Environmental Health Sciences. Reliene, who received her doctorate from the Swiss Federal Institute of Technology Zurich in Switzerland, expands the scientific portfolio of the Center in the genetic and environmental causes of cancer. The Atmospheric Sciences Research Center (ASRC), based at UAlbany, is a center for research in the atmospheric sciences. Established on February 16, 1961, by the Board of Trustees of the State University of New York, its mission is to promote programs in basic and applied sciences, especially as they relate to the atmospheric environment. The center is connected to and shares faculty and resources with the university's Department of Earth and Atmospheric Sciences. ASRC performs research to study the physical and chemical nature of the atmosphere and its implications to the environment. Research areas include boundary layers, solar radiation, radiative transfer, atmospheric chemistry, aerosol physics, air quality, solar energy, cloud physics, climate systems, and air quality monitoring. In addition the center has a large "jungle research group" exploring atmosphere and biosphere relationships in the Amazon rainforest, the Alaskan Tundra, the Canadian Boreal Forest, and the Eastern U.S. The Climate System Sciences Section of ASRC, started in November 1989, conducts research to understand the Earth's global and regional climate system and to assess and evaluate the effects of climate change caused by both human activities and nature. The Northeast Regional Forensic Institute (NERFI) at UAlbany trains forensic scientists, while conducting research to improve the speed, accuracy, and effectiveness of forensic analyses. The DNA Academy is NERFI's forensic training program. Each of NERFI's academic programs takes advantage of collaboration and cooperation between UAlbany's Department of Biological Sciences and the New York State Police Forensic Investigation Center. The partnership was made possible by a 2004 grant from the National Institute of Justice. UAlbany's Center for Social and Demographic Analysis (CSDA) was established in 1981 to provide a research infrastructure for scholarship in the social sciences at the University at Albany, State University of New York. CSDA has since become the nexus for further investments by university administration and state and federal agencies. Positioned by these developments, CSDA joined the roster of NICHD Population Centers in September 1997. The center offers researchers access to computing facilities and statistical software, computing and statistical consulting, assistance with grant preparation and administration, and other related services. It collaborates with the Lewis Mumford Center — the university institute devoted to urban research — in efforts to disseminate data and fresh analyses of population trends revealed in the census and continuing census-related databases such as the Current Population Survey and the American Community Survey. CSDA has 41 faculty associates drawn from 15 departments that span the array of academic disciplines at the university. Among major research initiatives sponsored by the Center is the Urban China Research Network (funded by the Mellon Foundation), which brings together scholars and graduate students from around the world to study implications of urban change in China. New collaborative projects include initiatives on health disparities and the environmental impacts of metropolitan growth. On June 4, 2010, the university unveiled a new $12.5 million biomedical research center, The RNA Institute, whose mission would be to form an alliance of genetic scientists and biomedical investigators from New York's Capital Region to spur research and development into RNA and its implications for medicines, drug therapies and technologies, and curing disease. On Nov. 5, 2010, UAlbany announced The RNA Institute had received a $5.37 million grant from the National Institutes of Health/National Center for Research Resources (NIH/NCRR) and $2 million in matching funds from the State of New York to fund the design, engineering and construction of 15,000 square feet (1,400 m2) of research facilities on par with those of modern pharmaceutical companies. Comple On the same day, the institute announced the establishment of The RNA Institute MassSpec Center, dedicated to the development of mass spectrometry-based technologies for investigating the structure-function relationships of natural and synthetic RNA as tools for drug discovery. The Office of International Education Study Abroad & Exchanges sponsors 70 study abroad programs in 34 countries directly through UAlbany, but students can take advantage of more than 300 programs in over 80 countries throughout the SUNY system. Among the most popular international programs for UAlbany students have been Italy, Great Britain, Ireland, France and Spain. Students study abroad any time after their freshman year, up to and including their final semester senior year. Programs are available semester-long and for the full academic year, as well as in summer and during winter session. Its UAlbany Green Scene initiative is conducred through AT&T grant-funded research. UAlbany researchers study coordination of traffic signals and transportation patterns, with the goals of minimizing car-engine idling times, forging new carpooling connections, and communicating more effectively alternative transportation options to the campus community. Campus efforts were on display on Sept. 22, 2009, with "Destination Green," a day focusing on encouraging sustainable transportation. It highlighted the campus's alternative transportation options, which include hybrid buses, global electric motorcars (GEMs), public bus systems, carpooling, and bike-and-ride sharing programs. The campus designated April 2010 as UAlbany environmental sustainability month, with lectures, a regional student competition for the best renewable energy business plan, and campus greening projects. The UAlbany Student Association is a student run, non-profit, corporation which organizes and funds much of the student oriented activities on campus. The SA funds and recognizes 200 student groups, plans concerts, speaking engagements, and comedy shows. The SA impacts students in the classroom as well, through funding of general education courses. Modeled after the U.S. government, SA consists of three branches: executive, legislative (unicameral Student Association Senate), and judicial (Supreme Court). The SA is funded directly by the undergraduate student body of the University at Albany, State University of New York. The Student Association owns an 850-acre (3.4 km²) wilderness retreat facility in the Adirondack Mountains called Camp Dippikill. The cabins and campsites at Dippikill are open to reservations from the university undergraduates, graduate students, alumni, faculty and staff. University at Albany's intercollegiate athletics date back to the late 1890s, but its development was hampered for several decades by inadequate facilities, uncertain financial support, and the small number of male students in an institution designed to develop elementary school teachers. Tennis remained a constant from 1898 on and men's basketball dates back to 1909, but attempts to field teams in football (1922), baseball (1896–1901), swimming and hockey were aborted. Expansion into men's and women's sports increased after World War II, and then expanded greatly in the 1960s (men's sports of lacrosse, track & field, cross-country and swimming moved from club to varsity status, and women's tennis, softball, field hockey, basketball and swimming were introduced), a direct result of the introduction of the new Uptown campus and its expanded athletic facilities. A nickname change also occurred, the Pedagogues becoming the Great Danes — making UAlbany the only American college or university with that mascot. The school's colors are purple and gold. After the 1972 NCAA restructuring, UAlbany competed in Division III athletics until the 1995-96 school year, when it moved to the Division II level as part of a transition to Division I competition. That process was completed in the fall of 1999; UAlbany now has 19 varsity sports (8 men, 11 women) competing at the Division I level. All athletic programs are run by the university's Department of Athletics and Recreation. Other than the sport of football, the school's teams have been members of the America East Conference since 2001. Football participates in the Football Championship Subdivision level (formerly Division I-AA). The Danes were an associate member of the Northeast Conference, winning championships in that league in 2002, 2007, 2008, 2011 and 2012. Beginning with the 2013 season, the Danes moved their football program to the Colonial Athletic Association. On Feb. 15, 2012, University Headmaster George Philip announced that a new $24 million athletic and recreational complex would be completed in three phases, consisting of a new synthetic turn recreational field for students (finished in Fall 2012), a combined new football and soccer facility (completed in Fall 2013), and a refurbished track and field venue (finished in Spring 2014). Headmaster Philip also announced $6 million fundraising campaign to support the project. The students publish an independent newspaper, the Albany Student Press, commonly known as “The ASP.” Born as the State College News and published continuously since 1916, the newspaper has a circulation of more than 10,000 and serves student body and the surrounding community. The university has been home to scholars, scientists, and writers, including 2017 Nobel Prize winner in Chemistry Joachim Frank; 2018 Wolf Prize co-recipient Omar Yaghi, a University of California, Berkeley chemist; Alanna Schepartz, a Yale University chemist and a National Academy of Arts and Sciences inductee; Nobel Prize laureate Toni Morrison; Pulitzer Prize winner William Kennedy; gay rights pioneer Harvey Milk; Broadway actress and three-time Tony Award nominee Carolee Carmello; and Turing Award winner Richard E. Stearns. ^ "U.S. and Canadian Institutions Listed by Fiscal Year (FY) 2017 Endowment Market Value and Change in Endowment Market Value from FY2016 to FY2017" (PDF). Archived from the original on 2018-03-06. ^ University at Albany Media Style Guide (PDF). November 1, 2015. Archived (PDF) from the original on September 17, 2016. Retrieved August 2, 2017. ^ "Cuomo OKs UAlbany grant to build $165M tech complex". March 1, 2013. Archived from the original on December 20, 2012. Retrieved 2013-03-01. ^ "Gov UAlbany roll out ETEC Plan". March 1, 2013. Retrieved 2013-03-01. ^ a b "About the University at Albany". Archived from the original on 2016-02-07. ^ "Pathways to Health" (PDF). Archived (PDF) from the original on 2018-04-08. ^ "UAlbany Economic Impact Tops $1 Billion Annually". UAlbany Press Release website. June 3, 2004. Archived from the original on June 4, 2004. Retrieved 2004-06-03. ^ "History of The University at Albany". www.albany.edu. Archived from the original on 2016-10-11. ^ "Albany Student Press pages, 05-07-1970". ^ "Complete Narrative History". albany.edu/. Archived from the original on May 28, 2010. Retrieved 2009-04-23. ^ "The Center for the Literary Arts in New York State". albany.edu/. Archived from the original on 2009-02-02. Retrieved 2009-04-23. ^ "Nano college is officially SUNY Polytechnic Institute". Albany Times-Union. Archived from the original on 2014-09-09. Retrieved 2014-09-09. ^ "UAlbany Unveils New Health Sciences Campus - University at Albany-SUNY". www.albany.edu. Archived from the original on 2017-03-16. ^ "University at Albany to Host the Nation's First College of Emergency Preparedness, Homeland Security and Cybersecurity - University at Albany-SUNY". www.albany.edu. Archived from the original on 2017-03-16. ^ "Next UAlbany president makes SUNY history". timesunion.com. Archived from the original on 2017-06-23. ^ "Restored UAlbany Carillon Rings in Improved Sounds and Early Warning System". SUNY Albany. October 14, 2008. Archived from the original on September 5, 2010. Retrieved 2010-10-16. ^ "Rehabilitate Water Tower, Fountains & Main Fountain Area". UAlbany Facilities website. April 9, 2012. Archived from the original on January 9, 2012. Retrieved 2011-05-23. ^ "History of The University at Albany". Archived from the original on 2010-11-25. Retrieved 2010-10-16. ^ "Energy efficiency projects at UAlbany support Governor Cuomo's Build Smart NY initiative". New York State Energy Research and Development Authority. Archived from the original on July 15, 2014. Retrieved July 3, 2014. ^ "UAlbany Opens 'Liberty Terrace,' a 500-Bed Environmentally Sustainable Student Housing Complex - University at Albany-SUNY". Albany.edu. Archived from the original on 2014-06-05. Retrieved 2014-05-15. ^ "Campus Center Expansion". SUNY Albany. June 18, 2014. Archived from the original on June 19, 2014. Retrieved 2014-06-18. ^ "UAlbany Unveils Bob Ford Field". Archived from the original on 2014-10-08. ^ New York State Education Law § 356. ^ "The University at Albany Foundation". SUNY Albany. Archived from the original on 2010-10-06. Retrieved 2010-10-16. ^ "Portfolio of Properties". SUNY Albany. Archived from the original on 2011-01-01. Retrieved 2010-10-16. ^ "IRS Form 990" (PDF). Archived (PDF) from the original on 2017-06-20. Retrieved 2016-05-17. ^ "College of Engineering and Applied Sciences". Archived from the original on 2017-03-12. ^ "$4 Million Gift to Further Catalyze UAlbany's New Engineering Program". Archived from the original on 8 March 2017. Retrieved 8 March 2017. ^ "New School of Business Building Opens at UAlbany". Archived from the original on 2013-10-14. ^ Williams, Terri (2017-10-03). "Excelsior Challenge ensures New York State's first responders remain ready". Homeland Preparedness News. Archived from the original on 2018-05-14. Retrieved 2017-10-11. ^ "Rankings for 100 Best Values". www.kiplinger.com. Archived from the original on 2012-12-04. Retrieved 2009-01-27. ^ "Best Colleges". colleges.usnews.rankingsandreviews.com. Archived from the original on 2009-01-14. Retrieved 2009-01-14. ^ "Top 500 World Universities". www.arwu.org/. Archived from the original on 2008-08-22. Retrieved 2009-01-28. ^ "Faculty Productivity Index". chronicle.com/. Archived from the original on 2011-08-24. Retrieved 2009-01-27. ^ "Top 100 world universities in Social Sciences". Institute of Higher Education, Shanghai Jiao Tong University. 2007. Archived from the original on 2008-12-22. Retrieved 2009-01-21. ^ "Top 100 world universities in Social Sciences". Institute of Higher Education, Shanghai Jiao Tong University. Archived from the original on 2008-08-01. Retrieved 2009-01-21. ^ "America's Best Colleges". Forbes.com. 2008-08-13. Archived from the original on 2011-12-22. Retrieved 2012-01-14. ^ "10 MBA Programs That Lead to Jobs". usnews.com. 2014-03-11. Archived from the original on 2014-03-12. Retrieved 2014-03-11. ^ "Atmospheric Sciences Research Center - University at Albany - SUNY". www.albany.edu. Archived from the original on 2016-12-30. Retrieved 2016-12-29. ^ Rulison, Larry (2010-06-05). "New RNA lab could spawn jobs – Times Union". Timesunion.com. Archived from the original on 2014-05-12. Retrieved 2014-05-15. ^ Cooper, Robin K. (2010-11-05). "UAlbany will build $7.4M RNA research center". Archived from the original on 2012-10-26. ^ "Cancer Research at UAlbany RNA Institute Lifted by NIH Grant - University of Albany - SUNY". Albany.edu. Archived from the original on 2014-04-17. Retrieved 2014-05-15. ^ "Football - News - CAASports.com—Official Web Site of the Colonial Athletic Association". Caasports.com. Archived from the original on 2014-05-14. Retrieved 2014-05-15. ^ "Harvey Milk, '51: From Intramural Athlete to Civil Rights Icon - University at Albany-SUNY". Albany.edu. Archived from the original on 2014-05-02. Retrieved 2014-05-15. ^ "Broadway Star Carolee Carmello Welcomed Home". www.albany.edu. Archived from the original on 2015-10-19. Retrieved 2015-09-04. Wikimedia Commons has media related to University at Albany. This page was last edited on 31 March 2019, at 19:16 (UTC).